[Win Mac] Patented DNealian and Zaner-Bloser style CURSIVE Script Fonts and Printed Fonts allow you to design your own handwriting worksheets. Offer Indian language fonts and typefaces in various Indian languages. Library of 2100 fonts, that includes text fonts, decorative fonts, Symbol fonts and other various fonts. Offers a large variety of fonts for Windows and Macintosh, text fonts, display types, Calligraphy and handwriting, education, Foreign, special fonts and custom fonts. Developer of Chinese Traditional (KaiShu, MingLight) and Simplified (Song, Hei) fonts, in TrueType, ATM, and Postscript fonts for Windows, Macintosh, Unix and Linux platforms. Japanese and Korean (CJK) fonts are also available. Specialize in OEM licensing, Bitmap Fonts and customized solutions. Baseline Fonts is an independent typeface foundry offering a collection of historic fonts and new fonts. Foundry specializes in antique typewriter fonts for screenwriters and old-fashioned telegram fonts. Additional fonts covering Celtic, label maker, screenplay, classic, fun, books on type, and fonts for layout and design. Install and uninstall fonts in a click, set groups of fonts, and find and check fonts. 8 One Way Out Fonts Decorative fonts. Decorative fonts. Fonts includes full character sets, 3 icons, and meticulous kerning. Features 5,000+ free fonts with option of a shareware purchase of all fonts on site. Designs by Brian Sooy. Condensed and narrow-width text fonts. Also, picture and dingbat fonts. Unique, original, handcrafted PostScript Type 1 Fonts, TrueType Fonts and Typefaces for Windows and Macintosh. Over 2000 shareware and freeware fonts, create instant logos for websites, using any of the fonts at this site. View all the characters in any of the fonts available to download. TrueType fonts for role players, covering fantasy, ancient, symbolic, Blackletter, SciFi and special fonts. Shareware package that views fonts (installed or not), prints font catalogs, manages fonts, and installs and uninstalls fonts quickly. Publishes barcode fonts and MICR fonts for cheque printing. Provides a large free font database of fonts and dingbats for retrieval, search for fonts by full name or by first letter. Also has HTML reference cheatsheats. Focus is on original fonts, fonts based on historical calligraphy and digitizations of antique typefaces, as well as a collection of art and textures. Serious fonts for serious people. Original english and greek fonts. Offers manuscript, cursive, and DNealian-style fonts for learning handwriting, phonetic symbol font, and math and ASL-symbol fonts. Dingbat fonts for web designers to use in creating web graphics sets. Several free Windows TrueType fonts available. Horror movie fonts, all fonts are in True Type, Type1, and Open Type. Shareware fonts created and digitized by Thomas W. Otto. MICR / E13-B fonts for check encoding plus secure fonts for print check amounts and payee names. Free fonts of dropcaps, dingbats and all sorts of uncommon decorative fonts included. Company specializes in signature fonts, logo fonts, educational fonts, and commercial typefaces. Licensing for corporate identity typefaces, custom typefaces and Delta+ professional hinting for screen clarity. Fonts that are historically accurate reproductions of wood type produced in the 19th century in a variety of styles. Fonts are available only for the MAC in type 1 Postscript format. Contains thematically organized collections of freeware PC fonts, and utlities. Logos and signature converted into fonts for business and personal communications. If the business hours of School Fonts in may vary on holidays like Valentine’s Day, Washington’s Birthday, St. Patrick’s Day, Easter, Easter eve and Mother’s day. We display standard opening hours and price ranges in our profile site. We recommend to check out schoolfonts.com/ for further information. 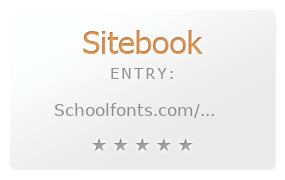 You can also search for Alternatives for schoolfonts.com/ on our Review Site Sitebook.org All trademarks are the property of their respective owners. If we should delete this entry, please send us a short E-Mail.